Are you running iOS 10 beta but have decided you’d like to downgrade and revert back to a stable iOS 9.3.3 release? That’s understandable since iOS 10 beta is sort of buggy, and it’s not intended for a prime time audience yet. We will show you exactly how to revert from iOS 10 beta back to iOS 9. The downgrading process is relatively simple, so if you have had finished testing iOS 10 beta or are just done with the bugs, you can quickly return back to iOS 9 on any iPhone, iPad, or iPod touch. To get started, you’ll need a USB cable for the iPhone or iPad to connect to the computer, and the latest version of iTunes installed in Mac OS X or Windows. Aside from that, reverting back to iOS 9 is simply a matter of using the proper firmware ipsw file to downgrade from iOS 10 beta with. The downgrade from iOS 10 works by restoring a device to iOS 9.3.x. This will effectively erase the iPhone or iPad so you’ll want to be sure you have a backup made, otherwise you’ll lose your stuff. To be perfectly clear, this will erase the device and downgrades from iOS 10 beta to iOS 9.3.x, it works like any other IPSW restore in that sense. Once the downgrade has completed, you can restore from a backup made previously. If you did not make a backup prior to downgrading (or updating to iOS 10 in the first place), you will lose all of your data on the iPhone or iPad. This is why it’s important to backup, and why it’s important to only run beta system software on a non-primary device that does not have important information or media on it. 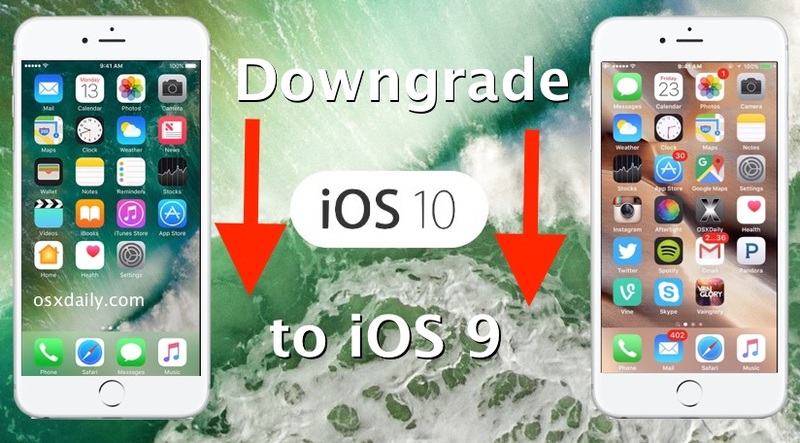 Some users report the typical downgrade process to uninstall iOS 10 and remove the beta is unsuccessful. This is likely due to a procedural issue, but regardless of causes, another option is to downgrade the iPhone or iPad in Recovery Mode, which removes iOS 10 with a Recovery Update and Restore process instead. Back up before beginning, as always. Any questions or comments? Let us know your experience downgrading iOS 10 beta in the comments below. I ran iOS 10 for a few days and just went back to iOS 9.3.2 using basically the same instructions. I put my device in Recovery Mode but it’s good to know you can do it without. Had to erase/reset the device of course, since iOS 10 backups can’t go back to iOS 9. Hi i downloaded the iOs 10 beta to my Iph 6+ and have crashing prob as well. I tried downloading the iOs 9.3.2 and tried restore iphone but unable to as I get the error message ” This iphone cannot be restored as the firmware is not compatible”. Please help !!!! How do you delete the iOS 10 beta profile? Tried doing it recovery mode way. it still shows the ios10 after saying its downloading. post which i get check your network settings. Have tried this number of times but doesnt work at all. Please suggest if any way i can do this. IPSW file is taking ages to download. Unfortunately, I had to downgrade my device as well from iOS 10 Beta to iOS 9.3.2. Lots of apps started crashing and it really made my experience bitter. Hi i downloaded the iOs 10 beta and have crashing prob as well. I tried downloading the iOs 9.3.2 and tried restore iphone but unable to as I get the error message ” This iphone cannot be restored as the firmware is not compatible”. Please help !!!! Do you know if that download works in another countries? I’m not sure if you found an IPSW yet. If you haven’t, please check out http://ipsw.me and download a signed firmware from there, then install it using the steps above. If you need more help, please don’t hesitate to ask. I’ve just recently downloaded the iOS 10 beta onto my iPhone, and I have been experiencing some major crashes in my apps. I really wanna downgrade back to 9.3.2, but I already backed up my iPhone on iOS 10, so my question is, if it’s possible to recover data after downgrading to 9.3.2? will downgrading delete all my carrier info??? ok i dont have a pre-ios10 backup. can i make a backup now while i have ios10 beta or will that not work. cuz if i restore to ios9whatever what if the backup doesnt go to the phone cuz the ios has chnaged? someone pleese explain i dont wanna change if my phone wont work. cant tthis website reply ples osxdaily??? I reverted because too many apps were broken — in truth, I should have expected this; and shouldn’t have installed the beta since I am not a developer. At this point wired backups via iTunes made with iOs 10.0.0 will not re-install even after you restore your phone; you’ll need to revert to a 9.3.2 iCloud backup, or a 9.3.2 iTunes backup. So, I didn’t make an iOS 9 backup before getting the beta (very stupid) therefore now the only way for me to downgrade is to loose everything. But, is it possible for me to at least backup my photos (and maybe messages)? I don’t really mind loosing my apps. I recently downgraded from ios 10 to 9.3.2 and what happened was I restored from the backup before the upgrade and only my apps, messages, phone log etc; was from the day I backed up. all my photos were up to date. I think this has something to do with if you have the sliders in your icloud settings like photos, keychain, and mail, not sure though. I hope this helps! So, I didn’t make an iOS 9 backup before getting the beta (very stupid) therefore now the only way for me to downgrade is to loose everything. But, is it possible for me to at least backup my photos (and maybe messages)? I don’t really mind loosing my apps, but I just want my photos (and maybe messages). Downgrade from iOS 10 works fine as is, you don’t need recovery mode. Use the “Update” button and select your IPSW firmware! That’s it! Photos and Music is saved, only iOS 10 uninstalls, but you might lose your contacts and messages, so save those separately if you want them. Also back up first, otherwise you may lose your stuff in the downgrade. Which one do I have a better chance in keeping everything ? This downgrade or the restore and update downgrade ? The only way to keep your stuff and downgrade is with a backup made from the prior iOS release, as mentioned in the article. Thus, if you have a backup from iOS 9, you would restore that iOS 9 backup after you downgrade back to iOS 9 from iOS 10. Without a backup from iOS 9.x, you can not keep everything if you downgrade from iOS 10, this is because iOS 10 backups do not restore to iOS 9.x. I didn’t backup to iTunes prior to installing 10. But my iCloud was backed up. Will using that after wiping the iPad clean still bring back the 10? I do have a backup from before I update but if I use it will my phone go back to how it looked before aswell ? Everyone, you can downgrade iOS 10 and uninstall iOS 10 and go back to iOS 9 without loss of data! You can uninstall iOS 10 without losing data! Yes really! Everything is the same except for which button you click! Choose the “UPDATE” button instead of the “restore” button, and use the same IPSW! Everything else is the same, just choose UPDATE button in iTunes to downgrade without losing any data!! Have you done this before or know anyone who has? If I just hang in there and put up with the ios10 will the real version this fall just override the beta or will I have to go through the uninstall anyway? No iTunes backup prior, just iCloud. Yes you can downgrade iOS 10 WITHOUT LOSING ANY DATA except messages and maybe contacts. You have to choose “Update” instead of the “Restore” button. Everything else is the same, photos and music are preserved if you choose the “Update” button instead. I have an issue with the music app. After downgrading, everytime i click to play the music it crash. Then i double click home button, it display the interface of music app in ios 10 beta. i cannot sync any music from itune. I delete every music form itune. But there is still music file in my device. (Found when i load songs form imovie). Please help me to solve music app crash issue. Having the exact same problem. I can’t live without my music. Did you fix it? I have an iPod Touch 5G, and I downloaded the iOS 10 beta. This beta affects my apps a LOT, as in being crashing frequently, and not working. So, I had followed the steps to downgrade back to 9.3.2, but whenever I try, it says “firmware not compatible” Am I doing something wrong? iOS 10 is not supported on iPod Touch 5th generation, you need to use iOS 9.3.2 IPSW file which matches the iPod touch to restore the device. You may want to try Recovery Mode too, then click on the “restore” button, it will format the iPod. This is the deal!! If you backed up your iPhone on iOS 9.3.2 recently you will be able to restore it as instructed here from that back up. If you didn’t back it up prior to updating to iOS 10 when you get to step four of these instructions you need to click update instead of restore as Barren stated above! I do the same and have success! Take no more than 10 minutes and my apps are here, my photos, my background and passwords. SPOKE TOO SOON!! MUSIC APP CRASHES AND WONT WORK! ANY FIXES? If I wipe my iPhone will i have any issues with my mobile carrier? If i downgrade my iphone into ios 9.2.3 or something. Can i update back to ios 10 if the apple officially release the ios 10? If i stay with ios 10 beta can i update back to ios 10 if the apple officially release the ios 10? Use the Restore Mode method for your iPhone. If you need your iPhone IPSW, otherwise you can use the “Restore” button without IPSW too. I did this, just downgrading back down to ios 9 without the backup because i didn’t want to lose the pictures i had taken since downloading the beta. I did it exactly as instructed but now whenever I try to click on the playlist button, my music app totally crashes. I can’t get to ANY of my playlists now, is there any way to fix this or something? I don’t care about losing what I had on them because I can easily re do them but I’m irritated I can’t make one and just listen to specific songs. While using 10 beta has anyone experienced any problems receiving calls? People say they call but my phone doesn’t ring and there isn’t any missed calls. Will I eventually have to go through downgrading from iOS 10 beta to iOS 9 when the real iOS 10 update is released to the public? Or will I just be able to update right from iOS 10 beta to iOS 10? do u think its ok to do the recovery mode? even though my itunes on pc is not updated??? Do you have to use iTunes for this or no? I do not have a computer. How else can I downgrade so I can update to the real iOS 10?